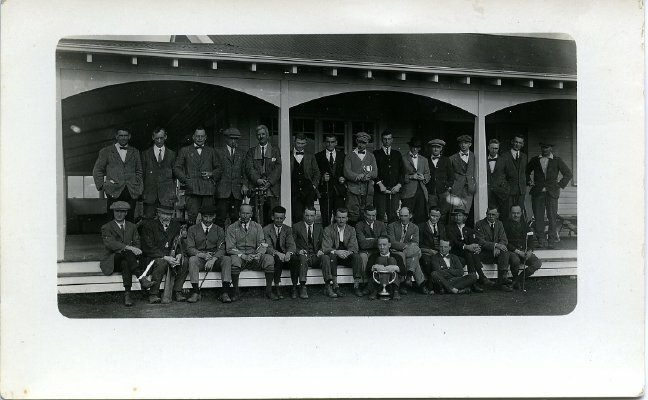 Description Civil Service v Law Golf Match 17 June 1928 at New Plymouth Golf Links. Won by Law by 29 holes to 17. A snap of the competitors after the match at the Golf House. Standing (left to right) Civil Service: Morris McClune; Butcher, Moyes, Waters, Mast; Laurie; Crump; Brown; Monteith; ? ; Worsley; Stephennon; Moore; Robertson; McGiven. Seated (left to right) Law: Morris; Little; Grey; P. Grey ; Burley; Johnson; Anderson; Grayling; Anderson; Whinngton;Larney; Burminahine; H? ; E.M. Stace.